How do you solve a problem like Correa? To many in the Anglosphere, Ecuadorian President Rafael Correa is best known as the guardian of all things Julian Assange, the WikiLeaks founder currently spending day 1381 holed up in Ecuador’s London embassy. This protracted saga has highlighted a remarkable flexibility in Mr Correa’s stance-taking: to the international community, he presents himself as an upholder of freedom of information, fighting the good journalistic fight whilst endearing himself to populist Latin American leaders by frustrating American intelligence at every turn. (Not the only trait they share; a penchant for anti-American rhetoric is a common feature). In his own country, Mr Correa’s commitment to the freedom to publish is a little less forthcoming. His 2011 libel suit against the El Universo newspaper – over an article on the topic of the 2010 police revolt against Mr Correa’s government – ended in a court verdict of $40 million of damages against the newspaper and prison sentences for 4 of its editorial staff, effectively putting it out of business. Though they were magnanimously waived by the president, these “draconian” measures did little to boost his standing with Reporters Without Borders. And domestically, while accusations of authoritarianism from his detractors were indeed shrill, it is difficult to see it as anything other than a show of presidential force. Sailing closer to the winds of authoritarianism, however, was February’s sudden sacking of the entire Ecuadorian General Staff. Nominally an effort to put-to-bed a dispute over army pensions, the shake-up does have the fortunate side-effect of allowing Mr Correa to place key allies in high positions, including his “knight in shining armour” from the 2010 uprising, Luis Ayala Castro. A cynic might view these actions as a consolidation of power, but a more indulgent interpretation of the president would see them as an effort to stabilise an Ecuador that, before Mr Correa’s election in 2007, saw 3 coups in a decade. Stability is also the order of the day economically, though it is harder to guarantee. Oil has been at the heart of Ecuador’s growth in recent years, annually accounting for 50% of the country’s exports by revenue and 30% of government income. But the recent collapse in prices (especially for low-grade Ecuadorian oil), coupled with high extraction costs – most of nation’s oil fields lie deep in the jungle of its eastern Sucumbios and Orellana provinces – has seen many producers pumping at a loss. In an effort to end its dependence on oil at home – and cleanse itself of environmental taint – the Correa government has looked to investment in renewables, most notably hydroelectric power. In 2014, over 50% of Ecuador’s domestic energy supply came from oil-based generation and efforts are now being made to redress the balance, with plans afoot to have 8 functioning hydroelectric plants by the end of 2016. But in export terms, Ecuador’s attempts to wean itself off the petrodollar have been hit by a double-whammy – just as the price of oil has gone through the floor, so the dollar has appreciated in value. The country dollarized in 2000, a measure taken by President Mahuad to call time on the rampant inflation of the Sucre, the previous currency. But now, a decade and a half on, the rising dollar is Ecuador’s Achilles heel as it fights to compete with neighbours like Colombia and Peru for non-petroleum exports. Furthermore, the viability of those exports themselves is now under question. Largely agricultural in nature, Ecuador is famous for growing bananas, the fruit providing approximately a quarter of the global harvest and generating $2bn in revenue. But fears have been raised for the health of the sector, with heavier than usual rains from the El Niño lowering output and the steady creep of fungal diseases across Latin American plantations posing a long-term existential threat. The government has taken steps to tackle these woes after a decade in the economic sunshine; recent negotiations between Finance Minster Fausto Herrera and his Chinese counterpart opened up a $7.5bn credit line between Beijing and Quito, despite the latter’s dubious record on debt repayment. Yet in the context of slowing, even negative, growth – some analysts predict a 1.1% contraction in GDP in 2016 after meagre 0.6% growth in 2015 – and forecasts that the nation’s debt will reach 35% of GDP by 2017, promises of easy Chinese money look like nothing more than a sticking plaster. Left-wing movement comes to power in mid-2000s promising evenly distributed wealth and opportunities, plus unprecedented social spending. Funds social programmes using revenue from high oil and commodity prices. Oil & commodities boom ends, plunging government finances into the red and blowing holes in much-vaunted social spending budgets. Can Ecuador break the cycle? Either way, Rafael Correa won’t be there to find out. The incumbent president is constitutionally barred from seeking re-election in 2017, with legislation allowing indefinite presidential terms only coming into force in 2021. His Alianza País party will have to soldier on without him and, if polls are to be believed, they have a task on their hands: according to a recent Cidatos-Gallup survey, almost 66% of Ecuadorians believe their country is on the slide, with over 80% “hoping for change”. What this actually means in practical terms is anyone’s guess, though it does offer a sliver of hope for Ecuador’s opposition. Until relatively recently, this was a mixed bag of regional and ethnic interest groups along with some trade unions and social conservatives but Correa’s departure, popular dissatisfaction with the current regime and economic turbulence might present an opportunity for these disparate entities to coalesce. At present, a likely figurehead for opposition to the AP in the run-up to 2017 is Guillermo Lasso and his CREO movement, but a year is an eternity in politics and, for now, putting together a successful protest on 1st May is a more manageable target. So, swimming against a tide of oil, dollars and bananas, Rafael Correa has a year to secure his legacy. 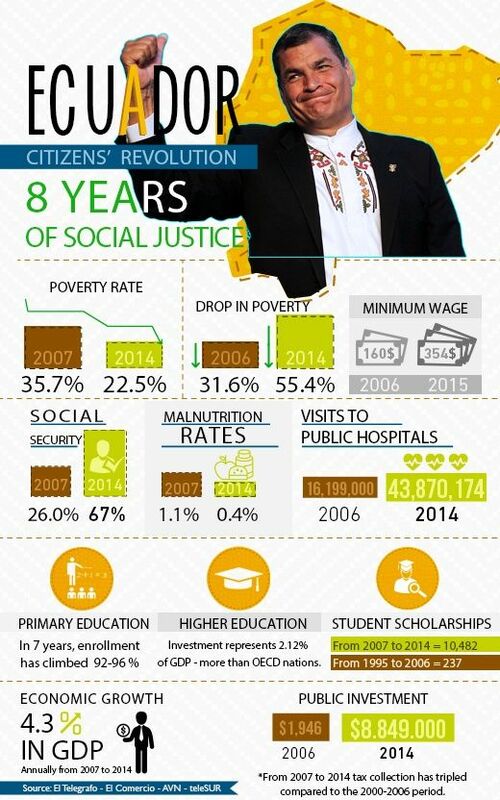 His hope will be that his rule will be remembered for bringing sustainable “21st Century Socialism” to Latin America. The risk is that he will always just be the man who bailed out Assange. This entry was posted in Ecuador, Energy, Natural Resources, Oil, Politics. Bookmark the permalink. 2 Responses to How do you solve a problem like Correa? Very informative. I have been wondering about the stability. You didn’t mention the elephant in the room-the United States and its current pressure on left leaning Latin governments, in the interest of the neo-liberal aganda. It will be a big player in next year’s election, I am sure. Yes, of course, it would be a mistake to think that the USA no longer wields considerable influence in the region, and that it is not prepared to use that influence where it can. Certainly in the case of Ecuador, Washington holds a considerable amount of “soft power” simply by dint of being their largest trade partner by a margin. But I think it is worth noting that the tone of diplomacy under the Obama administration has been significantly more conciliatory and less meddlesome than previous American governments. Take the recent trip to Cuba, for example: it may just be rhetoric, but pledging to lift the blockade and stressing Cuba’s right to self-determination was a major departure from previous US foreign policy, which has tended to assume US hegemony under the Monroe Doctrine for the last 200 years. And if it’s true of Washington’s attitude to arch-rival Cuba, it’s probably also true of their approach to Correa’s more moderate Ecuador. Perhaps also bear in mind that here is always a tendency on the part of left-wing Latin American movements to overstate the role of USA in order to abdicate blame for domestic problems. In the past, destructive US foreign policy has certainly been a major player in regional destabilisation, but in 2016 – particularly in light of the policy volte-face outlined above – there is less incentive for US involvement, largely because there is no Cold War to be fought. Mr Correa talks about “el nuevo Plan Cóndor” to topple left-wing governments in the region, but – as my colleague’s article below details – Venezuela’s current problems are largely of its own making (and US sanctions have only directly hit a handful of government officials) and Brazil has fallen apart at the seams without any help from the CIA. Given the history between themselves and the USA, it makes sense for the people all over Latin America to regard Washington with suspicion. But that doesn’t mean they should allow their politicians to use the American bogeyman as a mask for their own failures. In short, I can certainly see the US getting involved in Ecuador’s 2017 election – it’s what they do, as we are seeing here in the UK with Obama’s planned intervention in our own EU referendum – but it would come as a surprise if it were more than a State Department press release or a few off-the-record comments from the ambassador. It will be a factor, but domestic Ecuadorian issues – possible recession, unemployment, labour law reform – will be decisive. But there is certainly plenty of material for an article on emerging American foreign policy in the region. Look out for it in the near future!